Single-brasted There are 23 products. Italian bespoke grey “Prince of Wales” tuxedo with satin peak lapels and 1 covered button. Wool mix fabric. Tuxedo Wedding suit 2424 Black Tie Collection Ottavio Nuccio Gala. Italian bespoke black in houndstooth fabric with black satin lapels and black trousers, Tuxedo Wedding suit 2423 Ottavio Nuccio Gala, Black Tie collection. 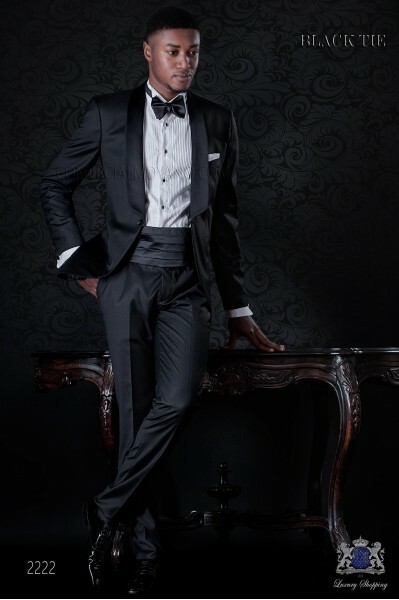 Italian black tuxedo with black contrast lapels. Jacket with satin shawl collar and 1 covered button. Black pure cool wool fabric. 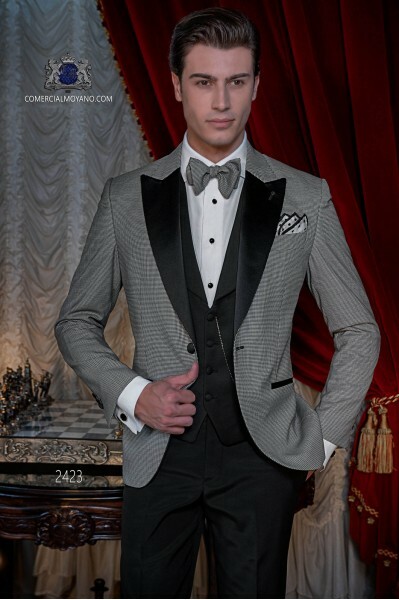 Tuxedo Wedding suit 2422 Black Tie Collection Ottavio Nuccio Gala.Houndstooth wool fabric trousers and waistcoat with shawl collar and 4 buttons. 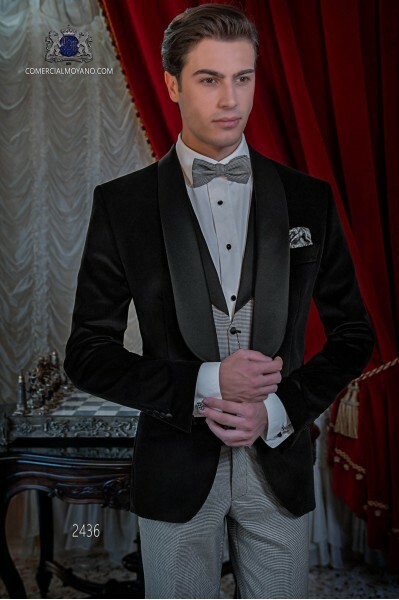 Italian bespoke black wool silk jacquard tuxedo with satin shawl collar and 1 covered button combined with a wool black trousers. 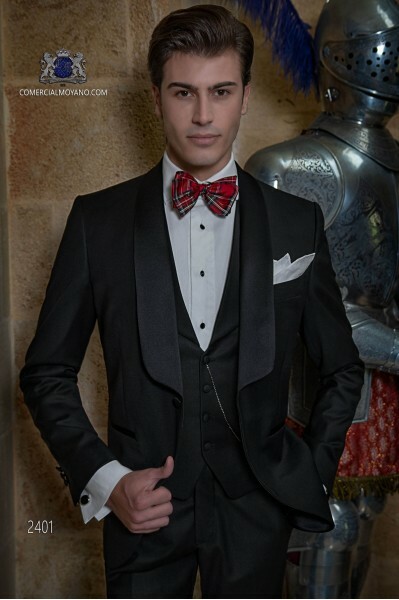 Tuxedo Wedding suit 2426 Black Tie Collection Ottavio Nuccio Gala.Black cummerbund and bow tie and pocket square to complete the outfit. 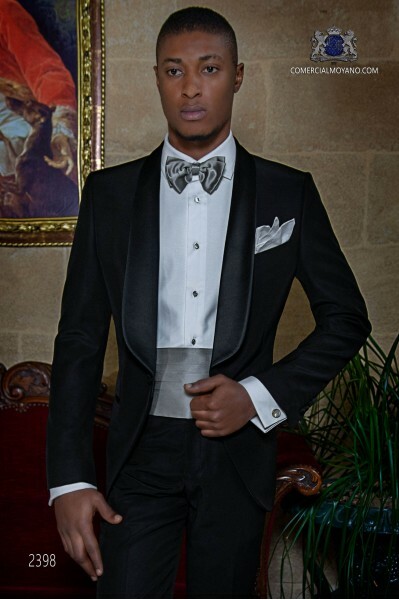 Italian bespoke black tuxedo with satin shawl collar and 1 covered button. Pure cool wool fabric. 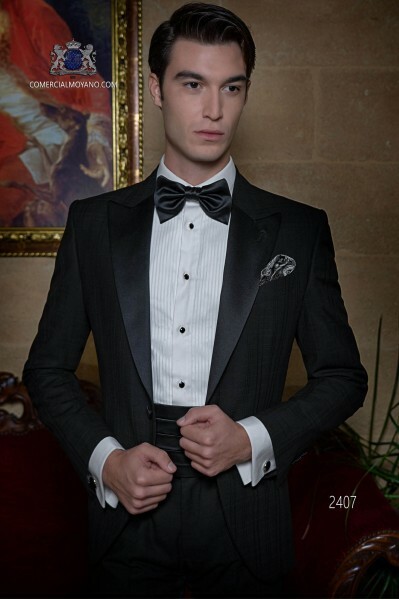 Tuxedo 2222 Black Tie Collection Ottavio Nuccio Gala.Black satin cummerbund, pure jacquard silk bow tie black. 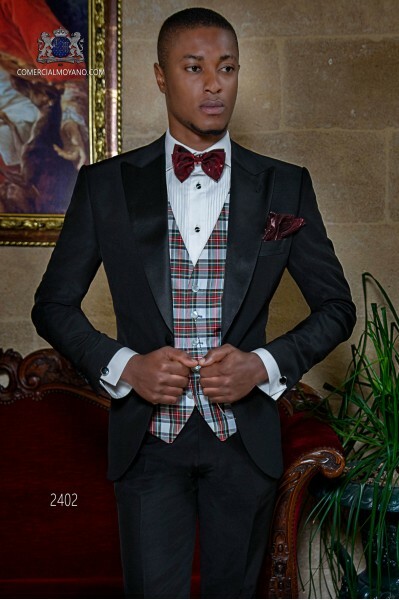 Black tuxedo with shawl lapel and 1 button in black satin. New performance fabric. 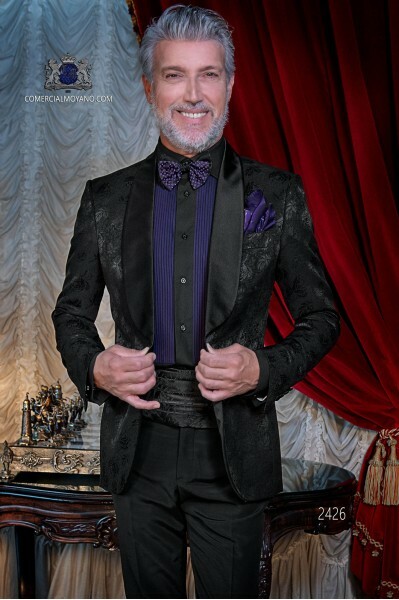 Tuxedo Wedding suit 2397 Black Tie Collection Ottavio Nuccio Gala. 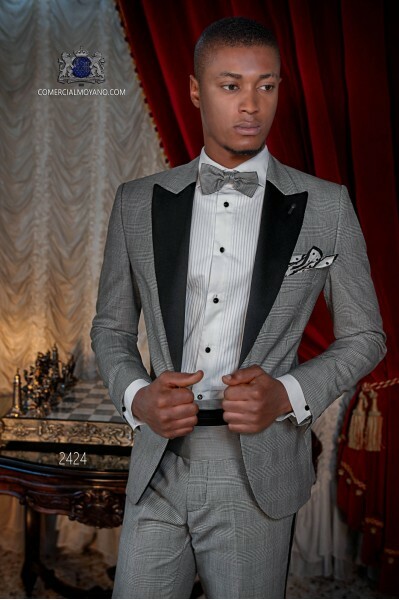 Black tuxedo with shawl lapel and 1 button in black satin. New performance fabric. 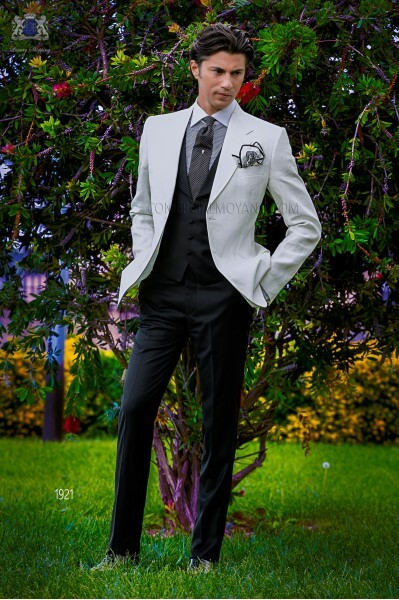 Tuxedo Wedding suit 2398 Black Tie Collection Ottavio Nuccio Gala. Black tuxedo with shawl lapel and 1 button in black satin. New performance fabric. 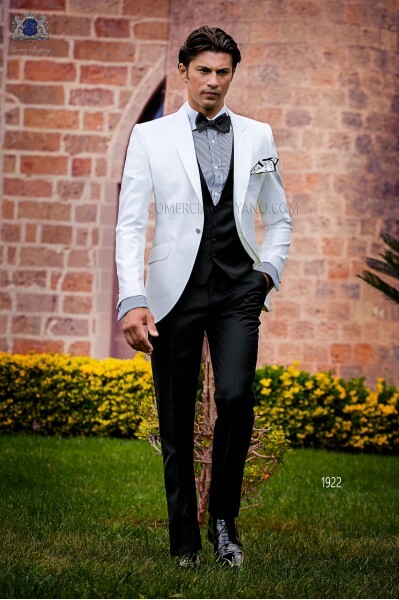 Tuxedo Wedding suit 2399 Black Tie Collection Ottavio Nuccio Gala. Black tuxedo with shawl lapel and 1 button in black satin. New performance fabric. 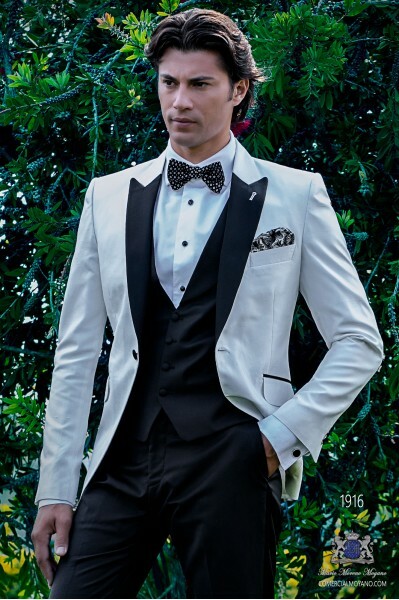 Tuxedo Wedding suit 2400 Black Tie Collection Ottavio Nuccio Gala. Black tuxedo with shawl lapel and 1 button in black satin. New performance fabric. Tuxedo Wedding suit 2401 Black Tie Collection Ottavio Nuccio Gala.Coordinated with vest 4 lined buttons and shawl flap of the same fabric. Italian bespoke black tuxedo with satin peak lapels and 1 covered button. Pure wool over check fabric. 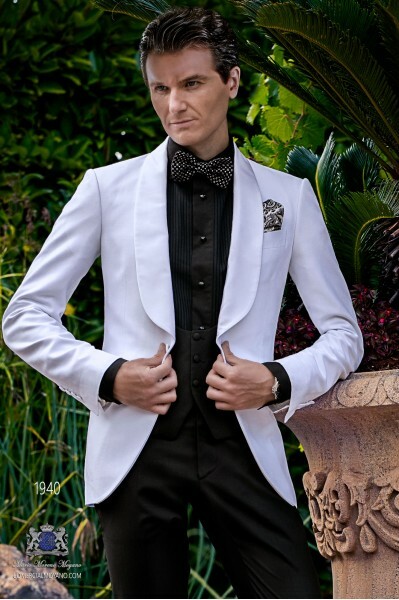 Tuxedo Wedding suit 2407 Black Tie Collection Ottavio Nuccio Gala. Italian bespoke navy blue tuxedo with satin peak lapels and 1 covered button. Pure wool over check fabric. 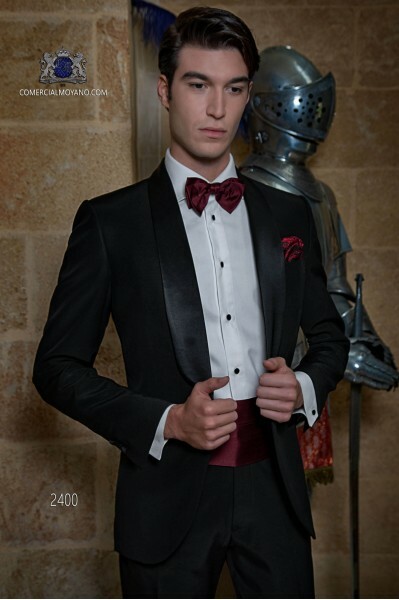 Tuxedo Wedding suit 2406 Black Tie Collection Ottavio Nuccio Gala. Coordinated with Scottish box straight vest. Italian bespoke black tuxedo wool mix suit with peak lapels, satin contrast and 1 button. 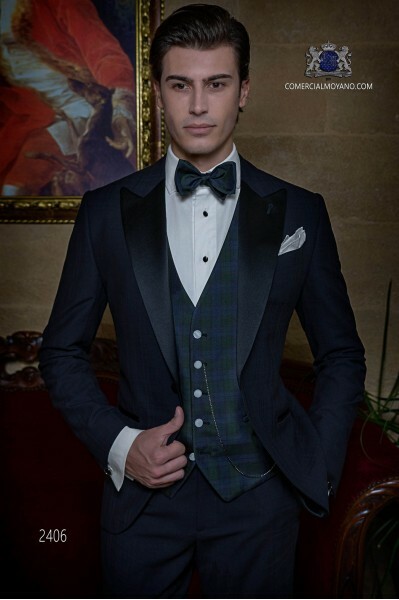 Tuxedo Wedding suit 2402 Black Tie Collection Ottavio Nuccio Gala.Coordinated with Scottish box challenge vest. Italian blue tuxedo with black contrast peak lapels and 1 covered button. Wool mix fabric. Tuxedo 1539 Black Tie Collection Ottavio Nuccio Gala. Black Watch wool tartan waistcoat, blue and green, with shawl collar and 4 buttons, pure silk tartan bow tie and white pure linen pocket square to complete the outfit. Bespoke natural white shantung silk dinner jacket with shawl collar and 1 covered button combined with a black trousers. 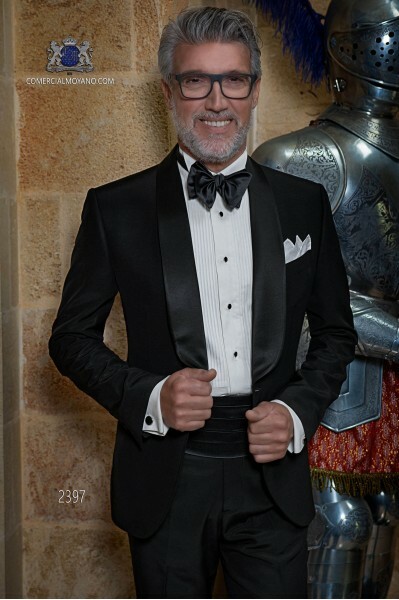 Tuxedo Wedding suit 2421 Black Tie Collection Ottavio Nuccio Gala. 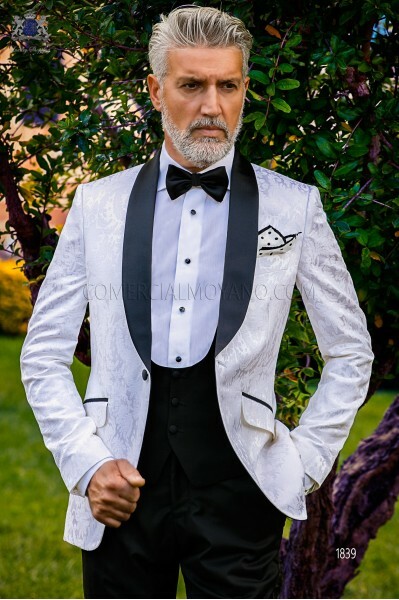 Italian bespoke white jacquard dinner jacket with black shawl collar and 1 covered button combined with a black trousers. Jacquard silk mix fabric. 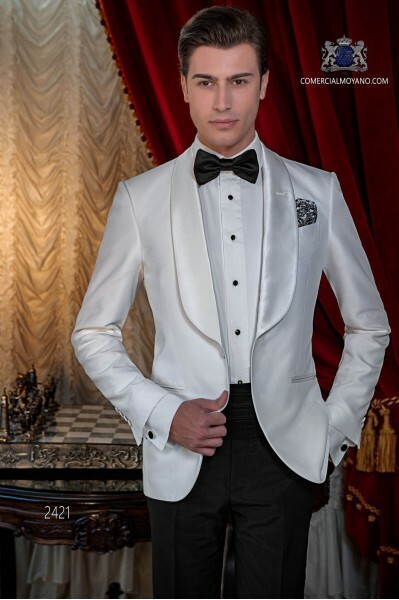 Tuxedo 1839 Black Tie Collection Ottavio Nuccio Gala. Pure cool wool black waistcoat and trousers, black satin bow tie and pure silk polka dots black and white pocket square to complete the outfit. 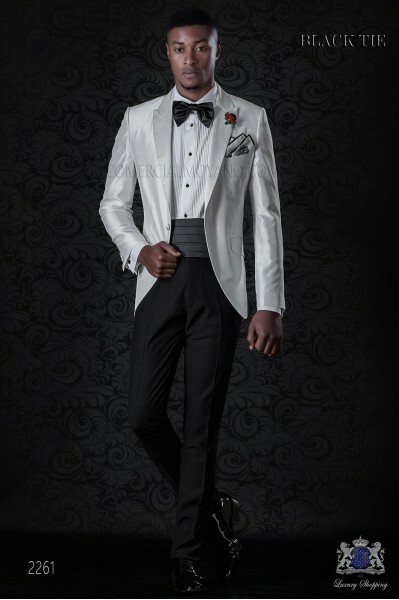 Bespoke white dinner jacket with satin shawl collar and 1 covered button combined with a black trousers. Tuxedo 1940 Black Tie Collection Ottavio Nuccio Gala. Black waistcoat and trousers, pure jacquard silk black bow tie with silver micro design and pure silk pocket square black and white paisley design to complete the outfit. Bespoke natural white shantung silk dinner jacket combined with a black cool wool trousers. Tuxedo 1922 Black Tie Collection Ottavio Nuccio Gala. Pure cool wool black waistcoat and trousers, pure jacquard silk bow tie black with white polka dots design and pure silk white pocket square with black polka dots design to complete the outfit. Bespoke natural white shantung silk dinner jacket combined with a black cool wool trousers. Tuxedo 2261 Black Tie Collection Ottavio Nuccio Gala. Bespoke black & white shantung silk dinner jacket with peak lapels and 1 covered button combined with a black trousers. Tuxedo 1916 Black Tie Collection Ottavio Nuccio Gala. Pure cool wool black waistcoat and trousers, pure jacquard silk bow tie black with silver micro design and pure silk paisley design black & white pocket square to complete the outfit. Bespoke natural white pure linen jacket combined with a black cool wool trousers. Suit 1921 Black Tie Collection Ottavio Nuccio Gala. Pure cool wool black waistcoat and trousers, pure jacquard silk tie black with white polka dots design and pure silk paisley design black & white pocket square to complete the outfit.